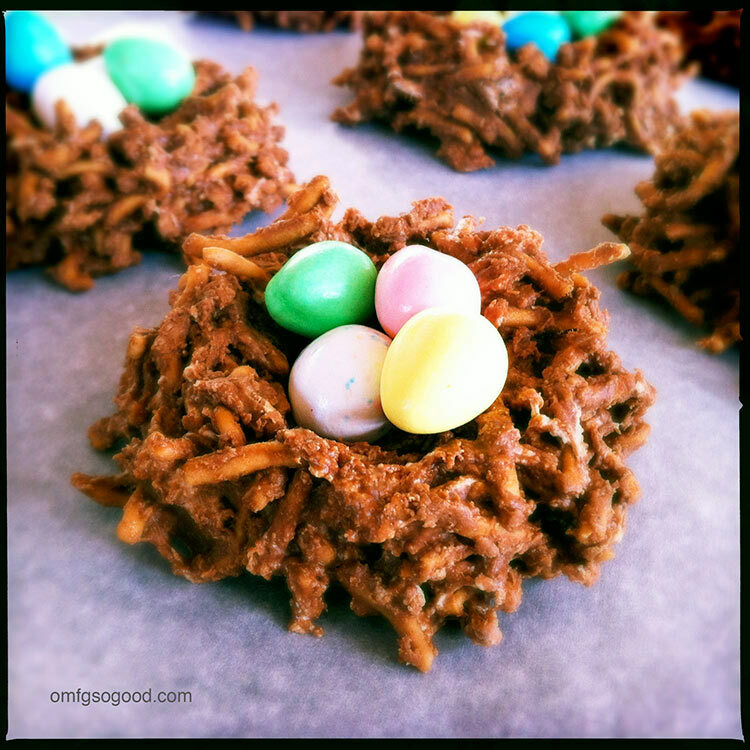 chocolate lo mein easter candy nests | omfg. so good. I love candy. I think I’ve mentioned this before. I also love candy-like treats that are made specifically to hold, cradle and protect more candy. Yes, I’m a child trapped in a lady’s body. A lady who looks forward to every holiday and the sheer joy of making, eating and gifting candy-like treats. Easter is no exception. Don’t get me wrong, I love a good krispie treat. But I also love a good salty-sweet plus textural contrast. So the thought of adding peanut butter, reducing the marshmallows and subbing out lo mein noodles for the rice cereal seemed like a no-brainer. 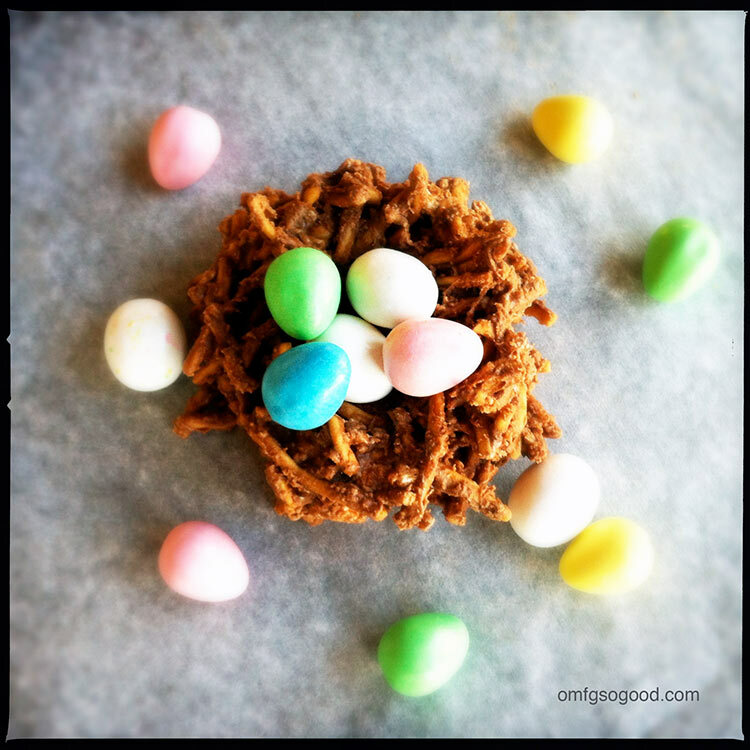 Plus, they look like tiny little crunchy, chocolatey, peanut-buttery Easter egg nests. No turdballs allowed in my kitchen. Line two sheet pans with parchment or wax paper and set aside. In a large saucepan, over low heat, melt the peanut butter and chocolate, stirring until completely melted and smooth. Remove from the heat, add in the marshmallows and stir to partially melt and coat (I didn’t melt them completely because I like to bite into a chewy chunk o’ mallow every now and then.) Add in the crunchy lo mein noodles and gently stir to coat with a wooden spoon. 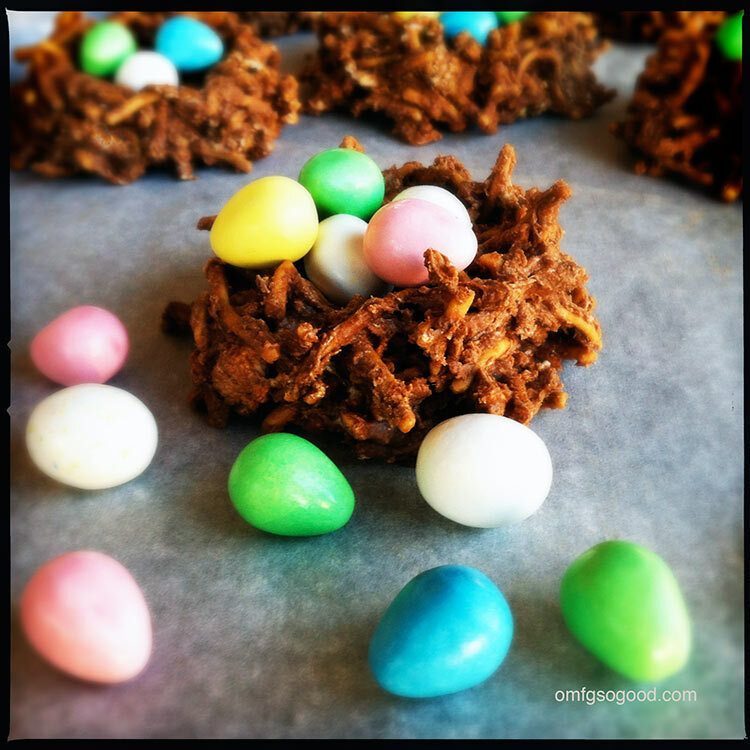 Drop by heaping spoonful on to the prepared sheet pans and use your hands to shape into mini-nests with a small well in the center to hold the candy eggs. Chill to set in the refrigerator (around 30 minutes) then add the goods. Kids are excellent helpers with this step. They have tiny little hands that happen to be the perfect size for maneuvering mini chocolate eggs. They also love any opportunity to play with their food. Oh my… God. What a great idea. I’ve never seen anything like this before. Sounds and looks so yummy!! Do you think these would taste good without peanut butter! my son is allergic…?